This item is a kit. This is a simple soldering project but assumes some soldering experience. a) Soldering iron intended for electronic assembly. 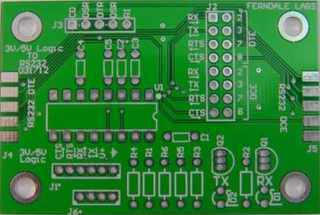 This board will translate UART logic signals from 3V to 5.5V to EIA/TIA-232 and V.28/V.24 specification. Output transmit levels are �5V and receive levels can up to �20V. Maximum data rate is 460kbps. 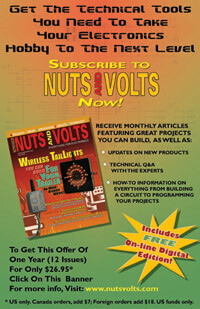 It requires 3V to 5.5V to operate at 3mA no load and 12mA with a maximum 3KΩ load. The board will translate both transmit and receive signals plus hardware handshake CTS/RTS signals. 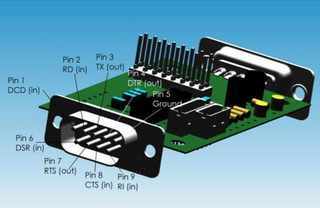 It can be a RS232 DTE (data terminal equipment) like a computer using a DE-9 pin male connector or a RS232 DCE (Data circuit-terminating equipment) like a modem using a DE-9 pin female connector. It can also snoop both transmit and receive as an inline device. 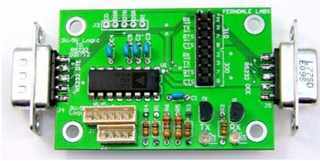 It has individual LEDs to monitor activity on the RS232 transmit and receive lines.